My current W-I-P involves multiple characters with multiple names, because they have secret identities. (Yes, I’m writing a very exciting book.) This has caused all kinds of problems during the writing process. I had the primary name for the characters — in other words, the name by which they are introduced to the reader — but I had not chosen the other names. In fact, I spent a lot of time worried that revealing the other names would just confuse the reader, and so I questioned whether it was even necessary, and then avoided thinking about it for a long time. Unfortunately, all that did was cement their primary names in my mind, which made choosing secret names even harder. Primary characters often come with names already attached, as if they were born elsewhere, named there, and shuffled into my head fully formed. 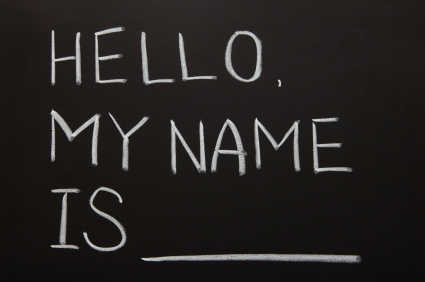 In those cases, changing a name is almost unthinkable…though I have forced it once or twice. The sound of names is also important. I read an article once (and I wish I could remember where, so I could cite it…if it was by you, give a shout!) in which the author made an interesting point about hard vs. soft names. If you had a romance novel and saw two characters, one named Lester and the other named Jack, could you guess who the hero is and who the best friend is? I don’t 100% agree with this, but I think that the way a name sounds does evoke a sensation. Pay attention to that sensation. I do. Baby name websites are popular sources for names. I like to find out the meaning of names, but I don’t usually choose a name based on its meaning. Often it’s so on the nose that it feels heavy-handed. I hate to say it, but one example is Elena from the Vampire Diaries. Elena means “light.” Get it? That said, I do like to know the meanings of the names I’m choosing, and if a meaning happens to work, it feels like fate. The Social Security names database is a great resource when naming secondary characters. This is especially important for something like YA, because name popularity can solidly place your story in one decade or another. Imagine writing a contemporary YA novel today and naming a bunch of characters Donna and Carol and Linda? All lovely names, and all names that are anachronistic names for teenagers by today’s standards. On the database, you can look in the time period in which your characters would have been born and pick names that feel current…because they are. Referencing past historical or literary figures is something I don’t often do, but could see myself doing if I took the time to think about it. If done properly, it can add depth to a character. Of course, if done wrong, it can also feel like a symbolic sledgehammer. How do you name your characters? What are some of your favorite character names? Why? Posted on July 16, 2012, in Character, Writing and tagged Elena, Names. Bookmark the permalink. Leave a comment.